My late grandfather James Fisher taught me how to shape a 3d or three pence coin into the shape of a spitfire fighter aircraft. 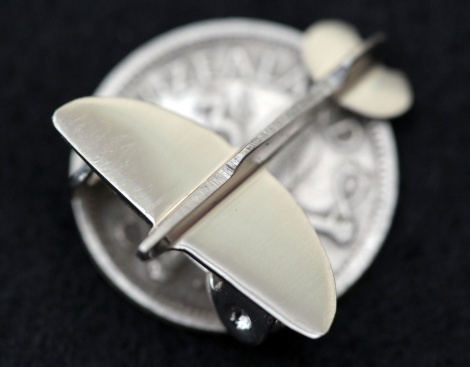 Jim, then a 15-year old in war-torn England, fashioned these brooches from English three pence coins during tea breaks from making real spitfires for the RAF in a factory near his home in Swindon. He used the three pence coin because of their high silver content , while I use New Zealand three pence coins for the same reason. My grandfather met my grandmother in the spitfire factory, where she too was employed during World War II. This type of jewellery is sometimes called trench art.